Home Make Money Google AdSense vs. Affiliate Marketing: Which one is better for you? You have landed on this excellent post because you are a blogger or an affiliate marketer, and looking for best options to make money online between Adsense vs. affiliate marketing RIGHT? If YES then this post will be so helpful for your upcoming blogging journey, and if you follow perfect steps towards your blogging, then you can be counted in successful bloggers in India or the whole world (Depends on your capabilities and decision-making style). Today we are going to cover everything about Google AdSense and Affiliate Marketing Basics and will share which one is perfect for you and which platform can make a good amount of money for you. Affiliate Marketing vs. AdSense is the main issue for those who just started their blogging, or you can say Internet Marketing career or those who are already running some blogs but can’t make a single penny from it and want to make some real cash from it. Well, every field of career has Pros ad Cons so we all bloggers should understand those things in blogging. Today’s, There are tonnes of ways to monetize a blog or website, but these two we are talking about are the major once. There are tonnes of ads display network in the market such as Chitika, Viglink, Infolinks and much more but which one used by most of the bloggers? It is called Google AdSense, It is one of the most favourite product from Google Inc. that allows users to show contextual ads on their blogs or website and it works on CPC based money flow, CPC stands for Cost Per Click. Which means if a user comes on to your blog and click on his/her search related ads than Google will provide you with a set amount which will base on user location and CPC of your keyword. AdSense would work on cookie method, for example, if a user searched “Weight Loss Pills” before landing over to your blog then Google automatically detect and show him ads related to weight loss products on your site. So this method will be helpful for a publisher that most of the time user will click on the ads naturally and it is a beneficial thing for you. Affiliate Marketing stands for selling others product and make a commission out of it. Let me make it simple for you and There are so many affiliate sites which are free to join such as ClickBank (For Digital Products), JV Zoo (For Internet Marketing Products). These platforms provide you lakhs of products to promote on the web and if you promote and make a sell for the vendor than that affiliate website will share a good percentage of commission with you. There are two types of products you can sell these days, Digital Products and Physical Products. You can make affiliate accounts on the sites I shared above and start exploring products and start promoting them on the web and make money out of it. Note: We will cover how you can promote products on different platforms in future and make quick sales from those platforms, so for that ensure that you have connected with our Facebook Page: IndianAffiliateProgrammes FB Page and never miss any update from our side. 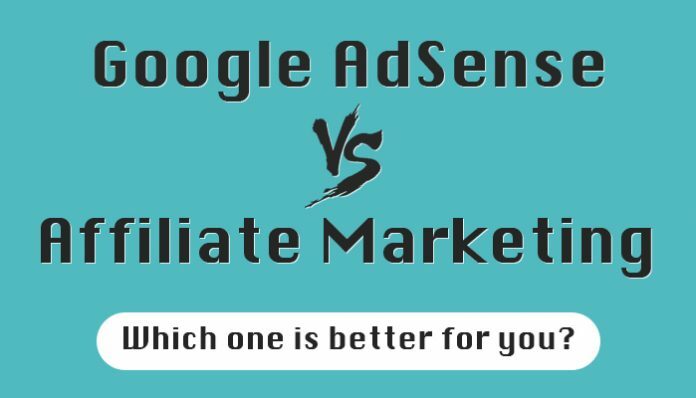 Below you can read pros and cons of Google AdSense and Affiliate Marketing and based on these, analyse your blog and then you can understand which platform is best and profitable for you to make money. It is a passive income source, but only if you have tonnes of daily traffic on your blog, then this platform can make a big amount of bucks on a regular basis. You can make new posts on the blog and increase your income again and again by putting more ads on those posts. AdSense is quick install platform on your blog which means just got approval from AdSense team and put your ads and BOOM you can start making money today. If your blog down with traffic then you’re earning will also down drastically. You can create a single niche review blog on a particular product, and if that product has only 100 visitors/month, then you can make more money than Google Adsense. It is a long-term business, and you can make a multi-niche review blog and start reviewing products and make sales via your blog. Collect users email via Subscriber Form and use this asset for future branding via Email Marketing. You can get 75% commission from products. (If product cost is $100 then your commission will be $75 instantly). It takes the time to rank Affiliate blog on Search engines, and it takes the time to find perfect buyers. Some platforms of affiliate programme are not easy to join. So I tried to cover all important things for newbies to understand which one is best for them Google Adsense or Affiliate Marketing. So I hope now you can understand the pros and cons of both of this money making sources. I hope you like this post and don’t forget to share this with your friends on social media. Next articleCreating a Powerful Online Presence for Marketing Success – the Why and How! This is very nice and Helpful blog for Newbie bloger, keep ut the good work. It’s very helpful and gives a lot of ideas to choose which one is best for my blog. Thanks for sharing this article.